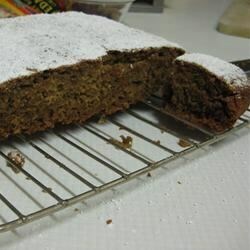 "Quick, easy and very moist spice cake! It makes a great snack!" Preheat oven to 350 degrees F (175 degrees C). Grease and flour a 9 inch square pan. In a medium bowl, combine raisins and flour. Add cinnamon, cloves and salt. Set aside. In a large bowl, cream butter and sugar until light and fluffy. Dissolve baking soda into applesauce and mix into creamed butter. Add flour mixture. Mix until smooth. Pour batter into a 9 inch square pan. Bake at 350 degrees F ( 175 degrees C) for 40 to 50 minutes or until a toothpick inserted into center of cake comes out clean. It was easy to make. Obtained a messy, sticky goo upon chopping the raisins with my food processer. Should be left as they are. Awesome. I didn't have ground cloves on hand, so I used allspice. I also substituted dark brown sugar for the white. Definitely a keeper. Thanks, Corwynn. Super easy and super delicious AND healthy too! Cloves were a bit strong. Will reduce next time. Only alteration was I put in 1/2 cup of finely chopped walnuts! Yum I am saving this one!